All event information including Bloom200 and other health related currated by HoLISTIC NATIONAL. At Cerrito Vista Park El Cerrito on Saturdays 10 – 11am. REGISTER to receive the schedule information and access to YouTube video materials! Shinya Y. who learned Tai Chi Chen in Shanghai, Seattle, New York, and San Francisco from 3 masters last 20 years. 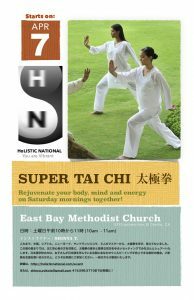 Will share basic Tai Chi principles for your health and wellbeing. This is FREE for the first lesson. $50 for 5tikets thereafter. This class will be mainly conducted in Japanese but I will explain in English as well.